Some general trends here: all of my dimes, with the exception of Ra and At the Gates of Loyang, are shorter games that take less than an hour. All of the games on this list—with one exception—are games I own, meaning I usually end up playing the games that I bring to the table. (I suppose this is probably similar for any hobbyist.) My Loyang numbers are a bit skewed, as many of these games were played solo. That I got in ten games of Ra since October (when I got the game for my birthday) is…well, a little crazy. What can I say? I love auction games! There are some notable numbers that are skewed on this list. Believe it or not, even though I played 33 games of Dominion this year (41 if you count the plays of just Dominion: Prosperity), that number is far lower than the actual number, I would imagine. While I started recording my plays in April, I have owned Dominion since last October. Oh, and usually I play Dominion with all the expansions mixed in. When I play this way, I record the game in the BGG database as “Dominion.” When I play with cards from one expansion only, I record it as that expansion. It’s strange to have had eight plays of just Prosperity, but my wife enjoys playing with only that expansion sometimes; that’s what I attribute that number to. The Incan Gold number is also far too low, I think. I got this game last January, and the bulk of its plays were in the first few months, when most of my friends wanted to play nothing but that. My wife and I tired of that game and put it away for several months after that. It’s slowly been making its way into more normal (albeit moderate) rotation since then. It helps that our niece and nephew love it. The Agricola number is also far too low. I acquired this game last January after a B&N super couponing effort (paying a mere $5.80 out of pocket for the $70 game). During what Midwesterners called “Snowmageddon” or “the Snowpocalypse,” when my wife and I were confined to our quarters for a full day, I remember playing at least nine games of this while we waited for the roads to clear. It takes so long to set up; it seemed a shame to put it away after only a game or two. Stone Age, Midgard, and Ra are probably the games acquired most recently to make it on this list; Midgard and Ra came in October, and Stone Age in November. The Cosmic Encounter number is also low. I played (read: endured) many games of this pre-April. I’ve been more systematic in spreading out my plays since, and I’m not shy about suggesting alternatives. As a result, I’ve been able to keep my sanity and even enjoy my occasional plays (especially with the expansions mixed in: Cosmic Encounter is a game that gets much better with the expansions, in my opinion). For 2012, I’m trying to keep better records for the whole year, so I’m excited to see which games float to the top of the pack. 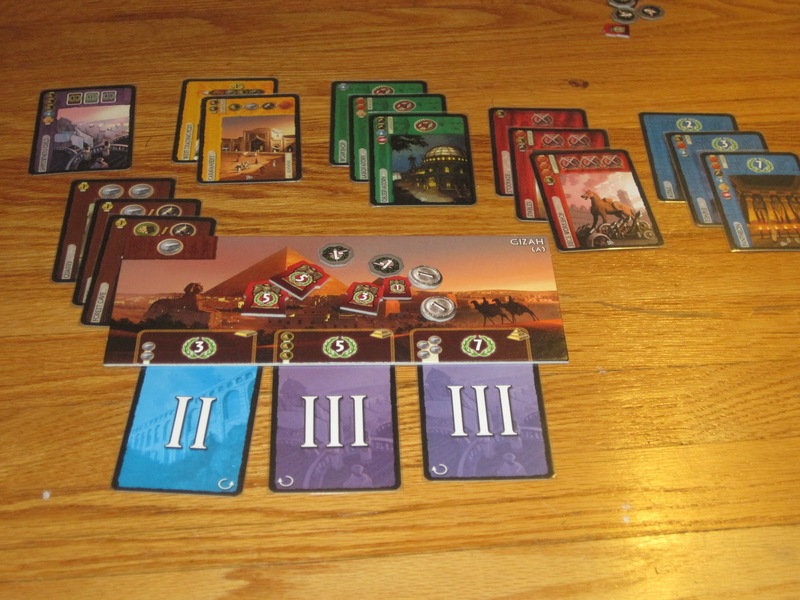 I predict that Dominion, 7 Wonders, For Sale, and Money will remain on the dimes list as they are good contenders to play with just about anyone, gamer or not. I’m hoping to push El Grande into the dimes this year, but with its longer playtime, I’ll try to be content with whatever I can get. I’m not sure about Wits & Wagers, as the group that enjoyed that game the most is mostly disbanded. I would imagine Ra will at least make the nickel list for 2012, though with @Futurewolfie’s aversion to it, I wouldn’t be surprised if it gets less play in the new year. I’m also not optimistic for Eminent Domain’s and Race for the Galaxy’s chances to make it on either list for next year. Race was traded away, and Eminent Domain might share its fate. While I like both games (though Eminent Domain has lost some of its luster through repeated play), it’s just so hard to find others who are enthusiastic about playing either. And really, while what game is played does matter somewhat, what really matters is finding others to share the hobby with. What games did you play a lot of in 2011? Which do you think will hit the table the most in 2012? Thanks for sharing, it’s always neat to get a glimpse into what others are playing. I love looking at and analyzing stats so year end break downs are great fun for me. From following you this last year I’m not surprised to see Dominion, 7 Wonders, and auction games make up a majority of your top plays. My most played games are also ones that I can play quickly and easily with my wife and/or family (Race For the Galaxy, Ascension, 7 Wonders, Biblios, and Dominion). It’s also great to see some older games present (Ra, El Grande), it’s sad when really great games get lost in the excitement to play the latest and greatest. Since you have a thing for auction games have you ever played Biblios? It fills a similar space as light auction fillers like For Sale but throws in some drafting elements as well. I was pleasantly surprised to see it in my top 5 for 2011 and am guessing that it took the place of where For Sale probably was for me in 2010. It’s quick to teach and actually plays quite well with 2 which is a big plus. If you haven’t tried it out yet I would highly recommend it. I just started tracking my plays this year as well since I was interested in what I was playing (and not playing). I regret not doing this sooner as I’m very interested to see how my playing habits change over the years. I’m planning to finally trade some of the games that I didn’t play but have been holding on to in hopes that they would eventually see some action. I’m hoping to see something new break into my top 10 from 2011 in the coming year. I missed out on playing some of the new releases from the end of the year since my wife and I just had our first baby in October and that kept us busy. There are quite a few games on my list to try out so hopefully there will be some winners out of that bunch. On the other hand I enjoy how expansions keep some of my favorite games fresh. I acquired some expansions for Christmas (Dominion: Hinterlands, 7 Wonders: Leaders, Thunderstone: Heart of Doom) and am looking forward to exploring these expansions further. Snuggles, thanks for the in-depth comment! I haven’t played Biblios, but I looked it up, and it looks fantastic. I will try to track down a copy. That’s a great use for the play tracker: seeing what games simply are not getting played. I was a little sad that one of my favorite games (Acquire) did not register at all on the list of games I played since April. I may have to change that soon (sorry, @Futurewolfie!). Those expansions sound like fun. I got Hinterlands as well; you’re in for a fat-deck treat. I’m not sure what the best place to get Biblios is, it seems to be sold out on most online boardgame sites but I have found it on Amazon. I was also sad to see some of my favorite games not get any plays last year (Amun-Re) and some only got a single play (Power Grid, Caylus, Taj Mahal, Through The Desert, Battle Line). Hopefully I’ll be extra motivated to get some of them to the table more often in 2012. I’ve played Hinterlands three times so far and was very impressed with the use of the new on-buy/on-gain mechanics. It’s also fun to see the pacing of the game change as piles can empty out extremely quickly. Anything that shakes up the traditional race for Provinces is a big plus in my book. I’m excited to get in more plays.